Fats Waller was a child prodigy who studied piano with virtuoso James P. Johnson. Some of his compositions may not be acknowledged because he occasionally sold the rights to his songs to pay off creditors. He was a larger-than-life entertainer of huge appetites who approached his compositions from the viewpoint of a jazz man, using blues progressions and unusual chord changes under swinging melodies. He published his first song in 1925, “Squeeze Me,” with a lyric by Clarence Williams. But his most fruitful collaboration was with lyricist Andy Razaf whose mother considered Waller her “other son.” They produced a string of hits in 1929, among them “Honeysuckle Rose,” “Black and Blue (What Did I Do to Be So Black and Blue),” “I’ve Got a Feeling I’m Falling,” and “Ain’t Misbehavin’,” made famous by both Cab Calloway and Louis Armstrong. The hits continued with “Keepin’ Out of Mischief Now” (1932) and “The Joint is Jumpin’” (1940) and “Jitterbug Waltz” (1942). 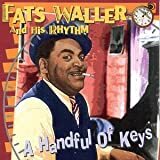 Few people know that Waller is considered the “grandfather of jazz organ.” He played pipe organ in his father’s church and for vaudeville shows and silent films and is recorded on both pipe and Hammond organs. He brought his own technique to the instrument and made it swing. He also played in several jazz bands and accompanied singers, including the great Bessie Smith. The 1978 Broadway tribute to his music, Ain’t Misbehavin’, won a Tony for Best Musical.